Good morning! I had a whirlwind of a weekend and Monday was pretty much a blur because I was so tired. 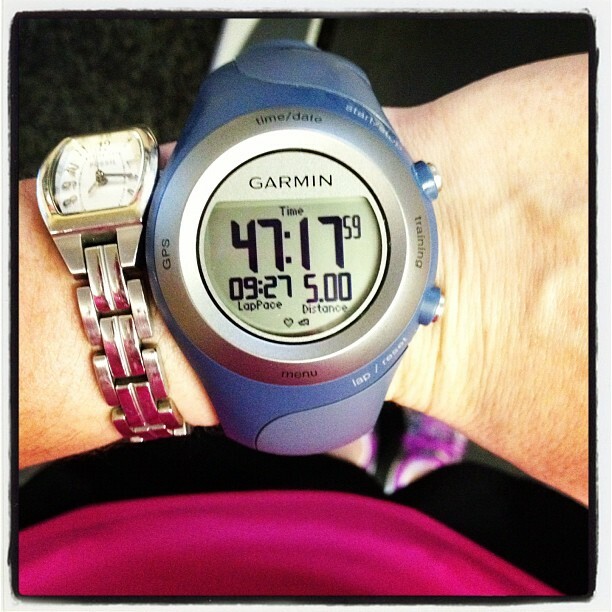 The weekend started out on a good note because I ran five miles!!! We spent all day Saturday and Sunday moving from our apartment to a house (only a 5 mile move). My plan was to move everything to the house on Saturday and spend Sunday cleaning our old apartment and unpacking at the house. My plan failed. At midnight on Sunday we finally finished moving everything after cleaning the apartment. And now there’s a lot of unpacking to do… For now, I’ve turned one of the bedrooms into a temporary second closet :). It’s going to be a busy week, that’s for sure! A busy week calls for a quick and easy lunch recipe! Lately I’ve been getting into lunch ruts. Part of the problem is that I usually have less than 5 minutes to eat lunch, but part of it is just that I’m a creature of habit. Last week I decided to make an effort to vary up my lunches. I wanted to make them nutritious and make sure they included at least one vegetable, since I often only eat veggies at dinner. This was one of my new creations! A kale quinoa salad with edamame, feta cheese and dressed with a lemon vinaigrette. I wasn’t sure if the flavors would meld together as they did in my imagination, but the recipe was a big success! Eating it in 5 minutes is a bit of a challenge, but when there’s a will, there’s a way! This salad makes a great lunch or a nice side dish with dinner. It serves about 4 as a side dish, and depending on whether it’s the only thing you’re eating for lunch or not, it will make 2-4 lunches. Did I mention it’s super easy to pre-prepare too? 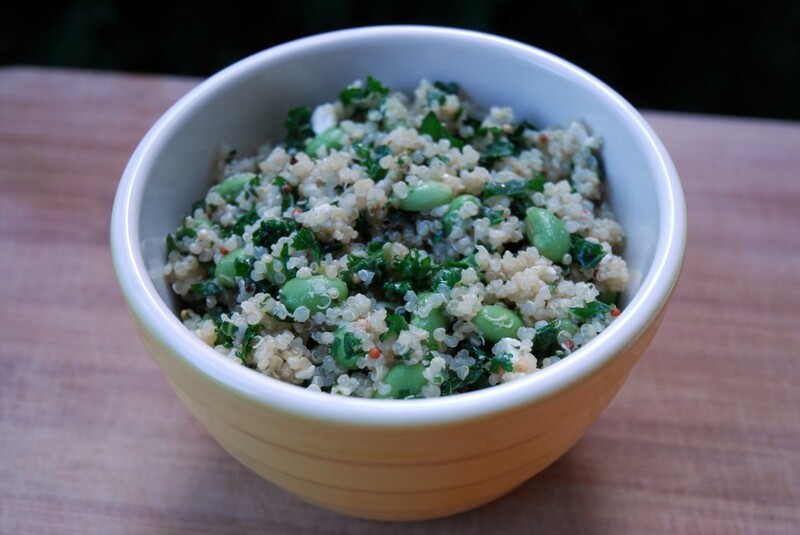 While your quinoa and edamame are cooking, finely chop your kale. 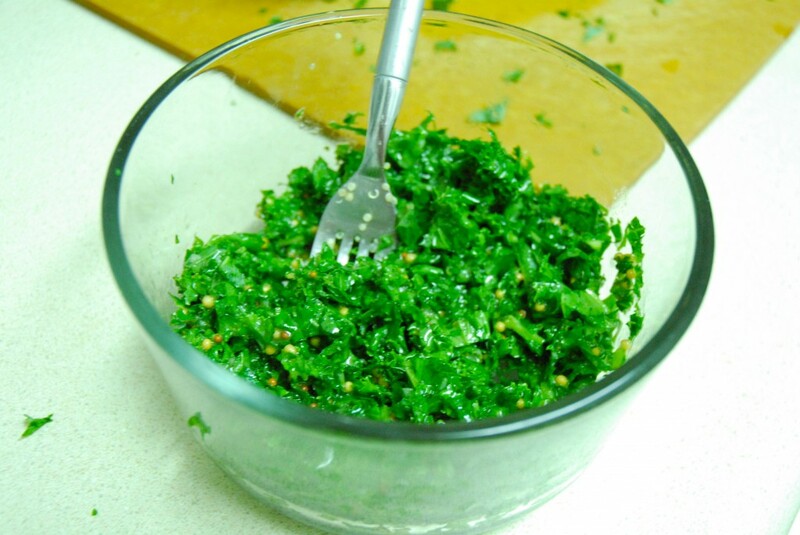 Transfer the chopped kale to a large bowl or tupperware container. Add 3 tbsp of the lemon vinaigrette, stir, and let it sit while the quinoa finishes cooking. When the quinoa and edamame are done, let them cool for a couple minutes. 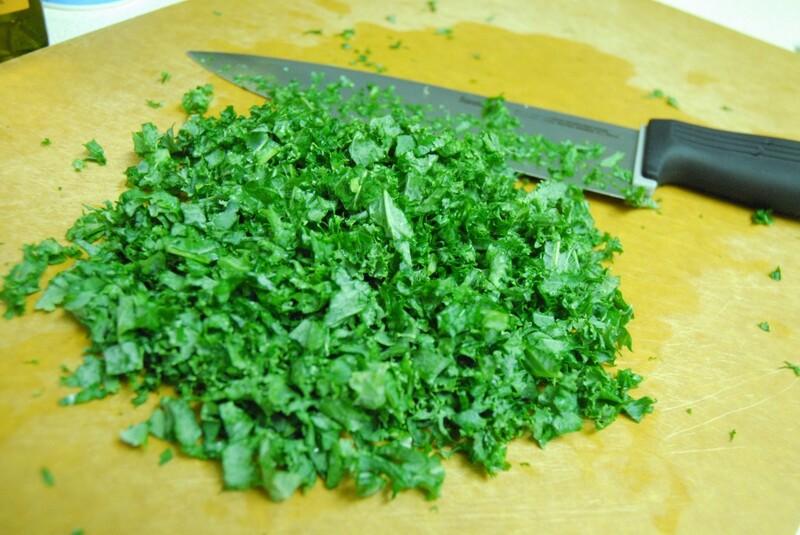 Then add them to the kale and stir everything together. Add another two tablespoons of the vinaigrette and the feta cheese and stir to combine. Serve at room temperature or chilled and enjoy! 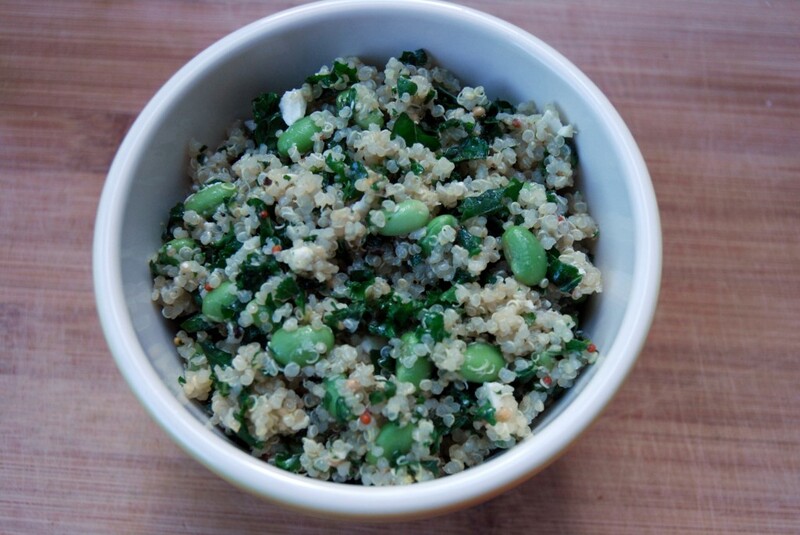 Cook the quinoa and edamame and finely chop your kale leaves. 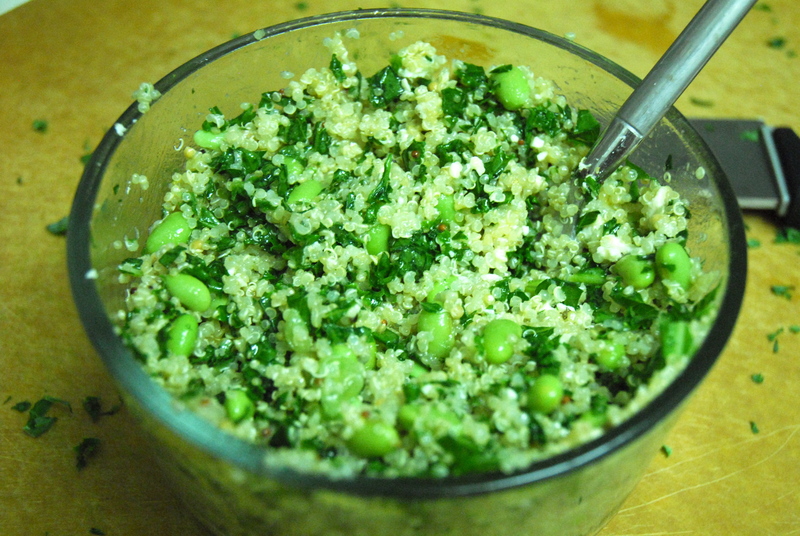 When the quinoa and edamame are done, let them cool for a couple minutes. Then add them to the chopped kale and stir everything together. Add two more tablespoons of the lemon vinaigrette and the feta cheese and stir to combine. *Note – This holds up well if you prepare it ahead of time. I like to make a batch on the weekend to eat for lunch throughout the week. This entry was posted in Gluten-free, Recipes, Running, Sides, Vegetarian and tagged gluetn-free, kale, quinoa, running, salad, sides, vegetarian. Bookmark the permalink. 7 Responses to Kale Quinoa Salad and My First 5 Mile Run! That salad looks so good! Great job on the 5 miles! Yum! That salad looks great and so healthy 🙂 Congrats on the five miles too! I ran four miles for the first time yesterday and was so excited about it! 5 miles is my next goal to tackle! 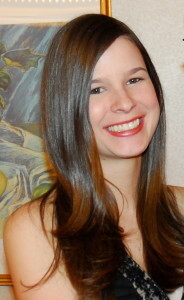 Danielle @ Clean Food Creative Fitness recently posted..What’s so bad about SUGAR?!!! You can do it! For some reason the jump from 4 to 5 wasn’t that hard – much easier than 2 to 3 etc. Then again, yesterday I ran outside and could hardly run 2 miles! Running outside can be so much harder sometimes! I really need to experiment with kale more in recipes. This is a great way to start! YUM! Congrats on 5 miles! That is great! awesome job on the run! congrats!